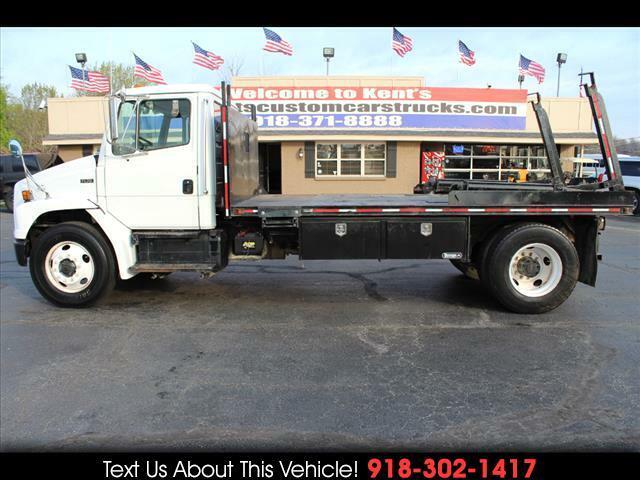 2004 Freightliner FL70 Conventional Cab Cable Handler Truck, Caterpillar 3126E 7.2L L6 Diesel Engine, Eaton Fuller 6 Speed Manual Transmission, Bed is 14'3" Long and 8' Wide, Hydraulic Brakes, GVWR 26000 LBS., Front GAWR 10,000 LBS., Rear GAWR 21,000 LBS., CDL not required, 4.11 Rear Axle Ratio, Wheelbase 204, AC, Cruise Control, Vinyl Seats, AM/FM Stereo with Cassette Player. For more information give us a Call at 918-371-8888 or send us a Text Message at 918-302-1417. Message: Thought you might be interested in this 2004 Freightliner FL70.